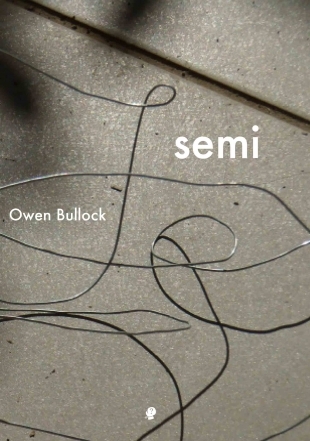 Semi by Owen Bullock was launched by Jen Crawford at the Poetry on the Move festival at the University of Canberra, 20 September 2017. It’s funny how much a book of poetry can carry what one feels to be the essence of a person in text form – at least, I’m often struck by that. And I guess the lovely thing about that is that sometimes you can have the book where you might not have the person. This book is a great example. I feel like this is a kind of portable Owen – it has all his gentleness, the good humour and the vaudevillean variety, the honesty that has both a lightness of touch and a resonant depth. This is not to say that Semi is in any way predictable. Indeed there’s a range and agility here that reminds me that Owen’s a guy who knows how to juggle. Swift movements of attention carry the grace of someone who’s been practicing their craft for a long time, and with great dedication. Those movements don’t give the sense of a fractured or fragmented sensibility, but rather of the hand moving faster than the eye across a very broad skill base, with an improvisational openness to play with whatever might arise. I’ve followed Owen’s movements for years – from New Zealand to Australia – and I’ve often been quite boggled by the volume of material that he produces and the quality he maintains across that body of work. Each book is worth reading, but this one strikes me as particularly special. Its poems form the creative component of his recently completed doctoral submission, and this means that it represents a kind of surfacing of a body of thought. Much like Hemingway’s iceberg there’s a certain amount here articulated directly in the words above the waterline, but you can also feel and discern the heft of the engagement that’s below. The sheer variety of ways that the page and the line are explored here are a great indicator of this. The work with form shows a really full engagement with concepts, with literature, with possibilities. And again it’s worth saying that these explorations are not piecemeal, but purposeful, sustained, oriented partly in the particular needs of the voice at a particular moment – narrating into the prose block, working the turn of the left-justified line, scattering away from the margin into space and erasure, distilling into grids, slipping in haibun-fashion from image into reflection, into narration. but instead we have the adjectival ‘hardworking’ – it’s a quirk of voice that somehow catches the spirit of something I see in that collaborative presence, too – the sense of acceptance, ongoingness, pleasure in dedication. There’s much more to say about this volume, about the generosity of self here alongside the openness to the world, for example – but we have just a little time to hear from Owen, so I want to make space for that. And for you to go acquire this lovely companionate book, which I am quite sure you will keep with you for a long time, as I will. Jen Crawford is an Assistant Professor of Writing within the Centre for Creative and Cultural Research at the University of Canberra. She is the author of eight poetry books and chapbooks, including Koel (Cordite Books, 2016), and recently co-edited Poet-to-Poet: Contemporary Women Poets from Japan with Rina Kikuchi. This entry was posted in Issue 24, Jen Crawford, Owen Bullock, Puncher & Wattmann, Semi and tagged Australian poetry, poetry by Mark Roberts. Bookmark the permalink.